The Marist Sisters are part of the world-wide Marist Family of Priests, Sisters, Brothers and Laity, founded at the beginning of the nineteenth century in the diocese of Lyon, France. In post-revolutionary France the great need was education of the impoverished country people. The Sisters undertook this work in schools and parishes and later they branched out to meet other needs in France and Western Europe. They came to Ireland in 1873, establishing a school in Carrick-on-Shannon, and subsequent years formed other Marist Communities. At present the Marist Sisters though small in number, work in all five Continents, mostly among the poor and marginalised. They engage in various ministries but mainly education and health care. At this time when vocations in Europe are few, there are many young Marist Sisters in Africa, South America and the Philippines. The central authority of the Congregation in based in Rome. 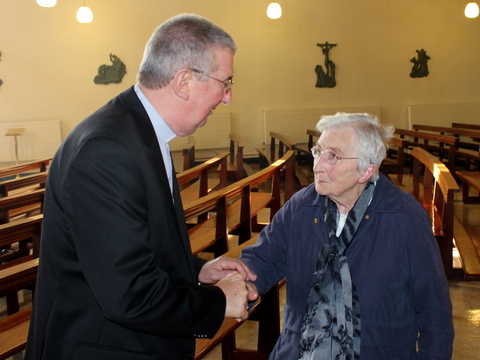 Sixty years ago Sr. Donal was professed a Marist Sister. This year she celebrated her Diamond Jubilee in the Marist Congregation. During those sixty years she has served in many roles in different places. She taught numerous students in secondary schools in Carrick-on-Shannon, Tubbercurry, Charlestown, Raheny and Crumlin. She spent many years in leadership roles, as school Principal, Community and Provincial Leader. On retirement she came to live in 185 Killarney Park. She now works as a volunteer in various organizations such as the Alzheimer’s Society and Citizen’s Information Centres, among others. We congratulate Sister on her sixty years of commitment and service to others, and we wish her many more years of health and happiness.